A pair of streamlined A4 class pacifics hauled the first leg down the East Coast Mail Line. We caught 4492 Dominion Of New Zealand (actually 60019 Bittern, on her first trip in her new guise) at Creeton, on Stoke bank, and Weston, by the Great North Road north ofNewark. 60007 Sir Nigel Gresley took over at York, but Mark had to be back in Oxford on Saturday evening, Laurie was flying home from the USA and TWR was busy in Lancashire, so we missed her on this occasion. There are only a few free paths for excursions to Aberdeen, and only on Sundays. 46115 Scots Guardsman crosses the Forth Bridge then skirts the North Sea at Lunan Bay, south of Montrose. Turning inland at Aberdeen, we catch up with her above Insch, leaving Keith and finally at Gollanfield Junction (for the former Fort George branch) near Inverness Airport. The “Far North” line is another route with few spare paths. The tour train was diesel-hauled to Wick overnight, with the passengers following by road early Monday morning. 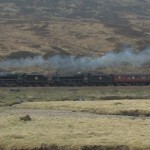 Ian Riley’s Black Five twins 44871 & 45407 are seen departing Forsinard, approaching Helmsdale and storming up Strath Fleet, between Rogart and Lairg. On more level track by the coast, we see them at Edderton beside Dornock Firth, leaving Tain, and between Muir of Ord and Beauly. Once again, 61994 The Great Marquess gave a great display of sure-footed hill climbing. On the outward trip, she’s seen at Fodderty, Corriemollie, Loch Achanalt and Loch Gowan. As in 2010, the early morning air is still and the lochs mirror-calm. Returning tender-first, we see her at the top of Glen Carron, surmounting Luib summit and alongside Loch a Chuilinn. 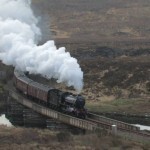 Inverness had four steam locos “on shed” for several days, but all left on Wednesday morning. First, 61994 and 46115 cross Culloden viaduct with three carriages. A little later, we see 45407 and 44871 with the main train on Culloden viaduct, climbing towards Drumochter summit, bursting out of Burnham tunnel at Byres of Murthly, and finally hurrying towards Gleneagles at Aberuthven. 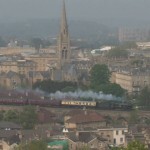 46115 Scots Guardsman was back in charge for the journey over former Glasgow & South Western lines. 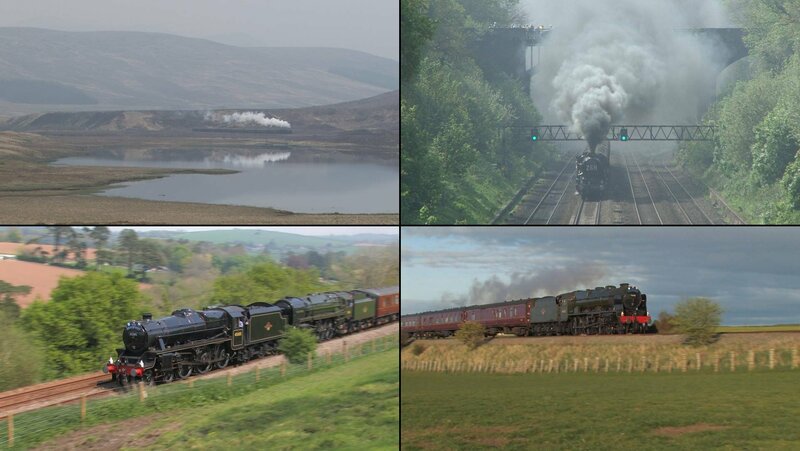 In early morning mist, the train passes Barr Loch and Kilbirnie Loch, on the line from Paisley to Ayr, crests the summit near Cumnock then starts to accelerate downhill at the head of Nithsdale. After a stop in Carlisle, we see her south of Penrith on the climb to Shap: passing the site of Eden Valley Junction at Clifton, near Great Strickland and approaching Shap village. Finally, we caught her at Forton (known to railwaymen as “Bay Horse”), just south of Lancaster. 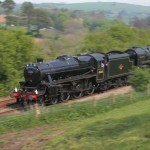 Because of gauging problems, 5029 Nunney Castle was a last-minute substitute for 6024 King Edward I. We first see the train restarting from a signal check at Preston Brook, and climbing towards Shrewsbury at Marley Green and Marbury between Wrenbury and Whitchurch. On the Welsh Marches route, we see it working hard at Church Stretton, Pandy and Llanvihangel. Finally, we see the train bursting from the east portal of Seven Tunnel and climbing from Pilning to Cattybrook. 45305 & 70013 Oliver Cromwell are both run by the 5305 Locomotive Association and this was the first time they had hauled a train together. We catch up with them at Beam Bridge and Whiteball tunnel, west of Wellington, on the fierce gradients at Dainton and Rattery, and St Germans between Plymouth and Liskeard. On a sunny Sunday morning, 5029 Nunney Castle stretches her legs on Great Western metals, running through Bath Spa station, climbing through Market Lavington and Wootton Rivers on the Berks & Hants, and finally accelerating through Sonning Cutting on the “up main”.